Time for more jewels from Queen Margrethe's 70th birthday celebrations! In this post, we're marveling at the jewels worn to the gala at the Royal Theatre. A volcanic ash cloud may have prevented some of the royals from making it to this event, but there was still plenty of sparkle to go around. The Queen selected the emerald parure from the Danish crown jewels for this birthday event. The set was made for Queen Caroline Amalie in 1840, but the 67 emeralds date from the eighteenth century. Crown Princess Mary wore the newly-renovated version of the magnificent ruby parure. 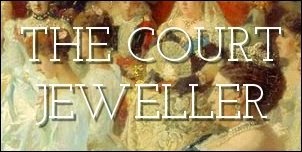 Read all about the history of the ruby set, which was worn at Napoleon's coronation, over here! Princess Marie wore the floral tiara; she also secured her sash with a diamond brooch. Countess Sussie of Rosenborg (seated behind Mary), wife of one of the Queen's cousins, wore Queen Alexandrine's Fringe Tiara. Countess Anne-Dorte of Rosenborg (seated behind Marie) is wearing a sapphire and diamond tiara that was originally a wedding present given to Grand Duchess Anastasia Mikhailovna of Russia, Queen Alexandrine's mother. Princess Benedikte wore the Sayn-Wittgenstein-Berleburg Fringe Tiara, as well as the diamond necklace that once belonged to Queen Alexandrine. Benedikte's younger daughter, Princess Nathalie of Sayn-Wittgenstein-Berleburg, wore her the Star and Pearl Tiara that once belonged to her grandmother, Queen Ingrid. Carina Axelsson, partner of Prince Gustav of Sayn-Wittgenstein-Berleburg, wore a diamond tiara and earrings. The Queen's youngest sister, Queen Anne-Marie of Greece, wore the Greek royal family's spectacular emerald parure. More about that set, which has Romanov roots, over here! Princess Alexia of Greece and Denmark, Queen Anne-Marie's elder daughter, wore her usual diamond floral tiara with dramatic drop earrings. Grand Duchess Maria Teresa of Luxembourg wore the Chaumet Emerald Tiara with the family's diamond and emerald choker necklace. Crown Princess Mette-Marit of Norway wore the convertible tiara from the family's amethyst parure. Crown Princess Victoria of Sweden, who would be the bride at a seriously glittering royal wedding in only a few months' time, wore the family's Four-Button Tiara with a string of pearls. Tune in later this afternoon for one more royal gala event!